Open issues about Terrestrial Concentrator PhotoVoltaic (CPV) projects and status. Way after the market close on Monday February 9, 2009, at 10:47 pm EST, EMCORE Corporation (NASDAQ:EMKR) released “EMCORE Corporation Announces Preliminary Unaudited Results for Its First Quarter Ended December 31, 2008”. However, neither the earning release nor the webcast from the 11th Annual Needham Growth Stock Conference on January 6, 2009, addresses the “project claims without update as 2008 closes” from my EMCORE Concentrator PhotoVoltaic Encore post. Since the year end 2008 post, I have been trying without result to obtain an update on these points from EMCORE. IEC certification of System expected by November 2008. Has this been completed or deferred until Gen-III? Completed construction and connected to the power grid in September 2008.
Who is the utility or project partner(s) for the project? Has the ISFOC, Instituto de Sistemas Fotovoltaicos de Concentración S.A., installation been completed? These must be Gen-II? Has this project been completed and where is it located in Spain? Is it the SOLARIG parks, “Pajarejos”, as some have speculated? SOLARIG claims Pajarejos has four 25 kWp (kiloWatt-peak) CPV trackers. Given EMCORE’s lousy track record on speculative CPV partners and projects, the management team should parse their presentations and comment on the status of each project. I’ve also pressed EMCORE for photos of completed installations. Again, nothing so far. The EMCORE conference call to discuss the Q1 2009 results will be held this morning, Tuesday, February 10, 2009 at 9:00 am EST. 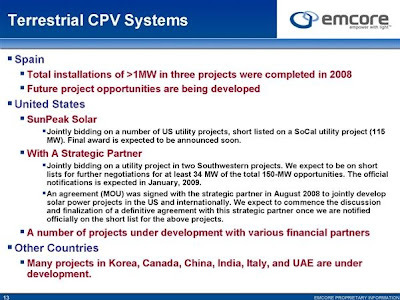 It sounds as though there has been some executive turnover at EMCORE impacting the solar photovoltaics segment. Another good question to ask the management team? As previously disclosed, the Company has received indications of interest from several investors regarding a minority equity investment directly into the Company’s wholly-owned Photovoltaics subsidiary which would serve as an initial step towards a potential spin off of that business. The Company’s management is aggressively pursuing these opportunities. Is Coronasys (http://www.coronasys.com/) or Corona Systems the name of the photovoltaic spin off company? The web address links to a copy of the current EMCORE website. Will this name alone enable new latitudes for effective CPV system operation? This is a hybrid technology powerstation built by Emcore. This is a very innovative project which is composed of 300 KW of dual axis, photovoltaic concentrators, manufactured by Emcore and 550 KW of fixed axis technology. Emcore is a world leader in the satellite solar cell market and terrestrial concentrator photovoltaic technology. Es una planta de tecnología híbrida construída por Emcore. Este es un proyecto muy innovador el cual está compuesto de 300 KW de doble eje, concentradores fotovoltaicos, construídos por Emcore y con 550 KW de tecnología de ejes fijos. Emcore es uno de los líderes en el mundo en el mercado de células solares para satelites y tecnología fotovoltaica concentrada terrestre. Seems insufficient to me. ISFOC completion alone merits a press release. I confirmed with ISFOC the 300kW EMCORE CPV installation and other power plant awards from the second phase call have just started. EMCORE now claims they began mid January 2009. ← Feed-in Tariffs: Solar FiT for Gainesville, Florida!